We firmly believe in offering you the most attractive prices allowing your publications to penetrate a vast global market extremely economically. We are not shy about publishing our prices because we want you to know from the outset just how inexpensive putting you messages online can be. 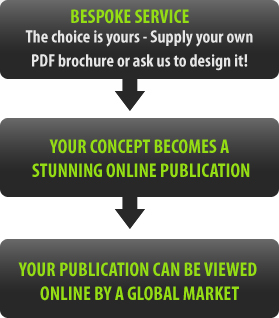 If you already have the design for your publication, simply send us a PDF file and we will do the rest and have your brochure, newsletter, catalogue or magazine online extremely fast. But there is no need to worry if you have neither the time nor expertise to create your own artwork; our team of writers and designers can create stunning bespoke publications for you that will not shatter your budget. Simply let us know what you would like us to create; supply us with any rough text and images and we will come back to you with our suggestions and a quotation. Please email us at enquiries@onlinedigitalbrochures.co.uk or fill in our contact us form to hear more about our low prices. Feel free to send your existing PDF brochure and we'll do a FREE no-obligation conversion into a stunning page turning digital brochure so you can see exactly how it would look. If you would like us to design and write your publications - simply send us a short written brief or rough text and any JPEG/TIFF images that you would like included and we will edit your text and provide an initial design and quotation.